CAUTION: Attempting to perform this installation task with the engine hot will likely lead to burned flesh! 1. Remove the end of the throttle cable from its attachment on the "constant radius" arm, on which it pulls, by holding the arm in the open position and slipping the barrel-shaped end out of its mounting slot. 2. Remove the clamp on the forward end of the rigid tube leading to the throttle body. Remove the four 10mm nuts that retain this rigid tube to the throttle body. It is NOT necessary to disconnect the small hose at the rear of this rigid tube. 6. After detaching the two small hoses attached near the filler cap, the upper portion of the oil filler neck must now be pulled away from the "Trailing Number 1" coil wire to allow its removal. WE STRONGLY RECOMMEND REPLACING ONE WIRE AT A TIME TO AVOID ERRORS AND POSSIBLY DAMAGING THE ENGINE.! Youll see L1 or L2 besides each hole on the leading ignitor. 1 means front rotor, 2 means rear rotor. Heres an easy way to remember the difference between leading and trailing. "L" for lower; "T" for top. 4) NGK spark plugs for trailing positions have two blue rings around the ceramic, near the tip and have a T on them, leading have an L.
4) Wires usually have 1 or 2 labeled on them. 6) Leading coil is in the middle, #1 trailing coil is toward battery, #2 trailing coil is near firewall. 7) Rotor #1 plug wire on leading coil is on top, #2 is on the bottom. 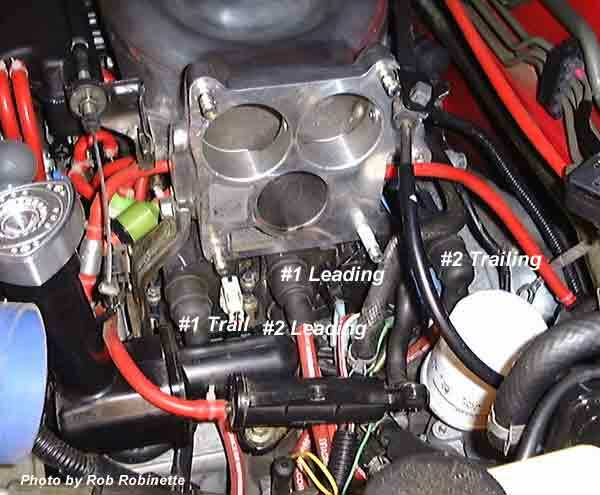 8) Rotor #1 plug wire on trailing coil is toward front, #2 toward rear. It is very easy to change the plugs from the bottom through the A-arm using a short ratchet. Just jack up the front left wheel and crawl under.